Dosbat: Lake El'gygytgyn and Arctic Warming. Lake El'gygytgyn and Arctic Warming. The post on which this is based has been in abeyance since before my recent illness, and resultant blogging hiatus. Due to questions asked in the comments of my previous post I've expanded it and am posting it as an answer to a question about how warm the Arctic has been in the past, and whether this throws light upon the claimed likelihood of an imminent and catastrophic methane blow out. 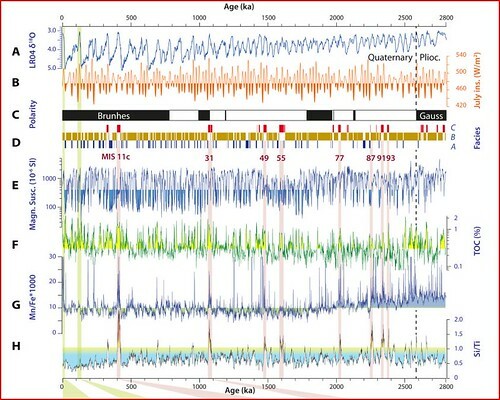 In Melles et al a sediment core of 380m is examined showing climatic conditions in Lake El'gygytgyn over the last 2.8M years. Lake El'gygytgyn is a lake formed in an impact crater in north east Siberia near the Bering Straits. Formed from an impact crater some 3.6M years ago it lies in a region of the Arctic that escaped glaciation. As a result Lake El'gygytgyn's sediment cores provide a record of Arctic climate change over millions of years. The sediment characteristics are able to throw light upon the conditions under which the sediment was layed down. Fig 1. Top panel of figure 3 of Melles et al. A - Changes in global Oxygen 18 isotope, a proxy for temperature. B - Mean July insolation, at 67.5 deg North. C - Magnetic polarity of core samples. D - Facies, which are regions of the rock core with specific characteristics, used to identify the Arctic super-interglacials, which are highlighted in red with the corresponding Marine Isotope Stage reference number. E - Magnetic Susceptibility - a measure of iron content. G - Manganese/Iron ratio, parts per thousand, see below. H - Silicon/Titanium ratio, see below. The ratio of Silicon/Titanium indicates diatom productivity, a high ratio is caused by high diatom productivity. This high productivity implies strong ventilation of the water column, and high oxygenation of the lake water. This oxygenation is also apparent in high magnetic susceptibility, due to deposition of oxidised iron in sediment with a reddish brown colouration to the sediment due to oxidation of iron, iron which would remain soluble as salts in anoxic conditions. The ventilation of lake waters is in turn related to whether the lake's ice cover is seasonal or perennial. During year round (perennial) ice cover periods, indicative of very cold summers, the ice presents a cap, with a layer of low density water below it and the physical presence of the ice layer that decouples overhead winds from the water below. During seasonal ice cover there is seasonal overturning of the water column. During winter the same conditions as perennial ice exist stopping mixing, similarly during the summer the water is warmed from above forming a cap of warm low density water, which doesn't mix with the deeper water. However during Spring and Autumn the temperatures, and hence densities of surface and deep waters are similar, which allows the wind to drive circulation that overturns the lake waters, distributing oxygenated waters throughout the lake. More here. So the condition of the sediment can show whether the lake was frozen over year-round, or was ice free in the summer. Temperature itself is determined by examining what types of pollen and other organic matter were in the sediment, this can be done because now plants have their own ranges that shift as one nears the Arctic Ocean. These ranges are related to climatic conditions, if the climate changes then the plant ranges shift, as is occurring in the Arctic at present. The reference for this is Kaufman et al 2004, it's been some time since I read it, but the above Wikipedia quote seems to sum it up reasonably. 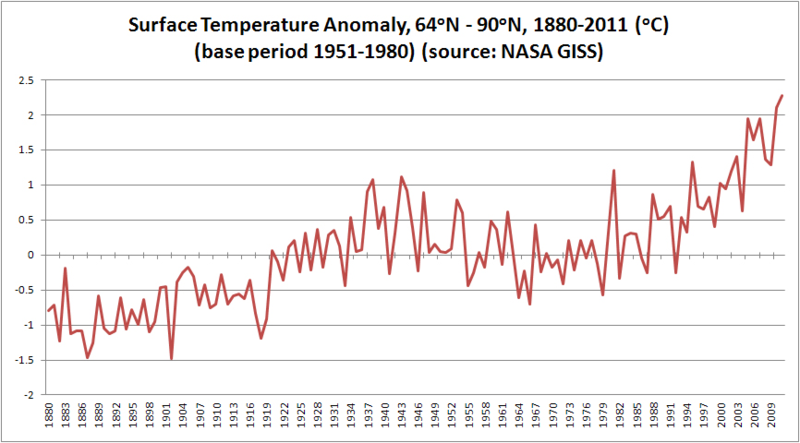 Note that in terms of temperature the "at present" used in Kaufman et al refers to the average temperature for the 20th century. At the current rate of warming the Arctic will soon surpass the HTM maximum. However the Arctic has been warmer still during the previous interglacials. The key point of Melles et al is that they find evidence of 'super-interglacials' in the Arctic which were much warmer than previously thought, about 4 to 5 degrees C warmer than at pre-industrial (temperatures of the warmest month). These warm conditions could explain why the Greenland ice sheet seems to have been reduced or absent during these super-interglacials. But crucially, using GCMs the authors argue that the super-interglacial warmth cannot be explained by orbital forcing or GHGs alone because these factors don't lead to such warmth in the models. Melles et al propose possible explanations for the warming. But first it's worth noting a factor they discount: They find that in Marine Isotope Stage 11, during which the Greenland ice sheet was lost, this loss of the ice sheet only caused a warming of around 0.3degC. This is to be expected given the distance between Greenland and North East Siberia, over 3000km. The factors proposed are higher sea levels, for example flows through the Bering Strait are limited by a water depth of down to 50m, the sea level rise from the loss of Greenland alone would be about 7m (IIRC), which would imply a substantial increase of flow though Bering. They also propose changes in ocean overturning linking the Antarctic to the Arctic, rather than trying to go into more detail I recommend checking out the paper if you want more on this. So during past interglacials the Arctic was as much as 4 or 5 degrees warmer than at present. During the recent Holocene Thermal Maximum the Arctic was about as warm as it probably will be by the end of this decade. But as I argue in my previous post, Arctic temperatures are headed upwards, what we are headed for is a super-interglacial. What was the situation regarding sea ice in the Holocene Thermal Maximum? Fig 2. 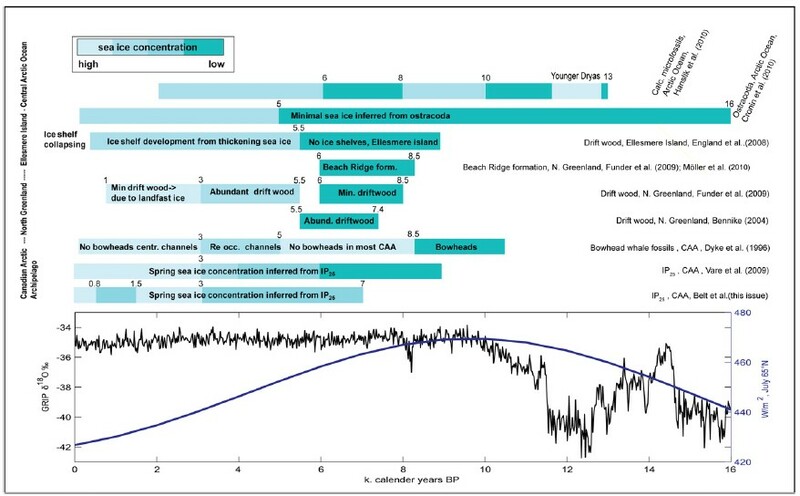 Figure 2 of Jakobsson et al, sea ice state during the Holocene. Jakobsson et al shows that temperatures inferred from Greenland ice didn't change much, while solar insolation changed massively. However the Oxygen 18 temperature proxy relates to the source of water for Greenland's ice, which is not mainly the Arctic. What is striking about the grouping of low sea ice concentration proxies between 6 and 8 thousand years is the implication that for some two thousand sea ice levels were low. Possibly lower than today, for at least about two millennia. Such millennial timescales are also implied for the previous super interglacials discussed above. This might seem like a problem for my claim (previous post) that with a 3degC (global equilibrium) we're unleashing Arctic methane and carbon dioxide. However the 3deg warming is for the global average, with Arctic Amplification we can very likely exceed the Arctic super interglacials with fossil fuels alone. What I've not done is put the recent warming into context with the research I discuss here. Before jumping to conclusions on the next two graphs remember that Melles et al are looking at the temperature of the warmest month, July. 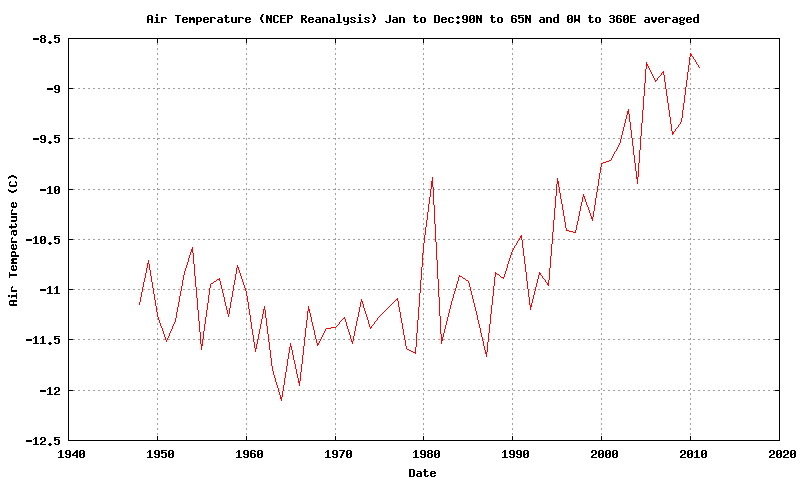 So here's NCEP/NCAR timeseries of annual average surface temperature north of 65degN. Fig 3. NCEP/NCAR Annual Average Surface temperature for north of 65 degN. 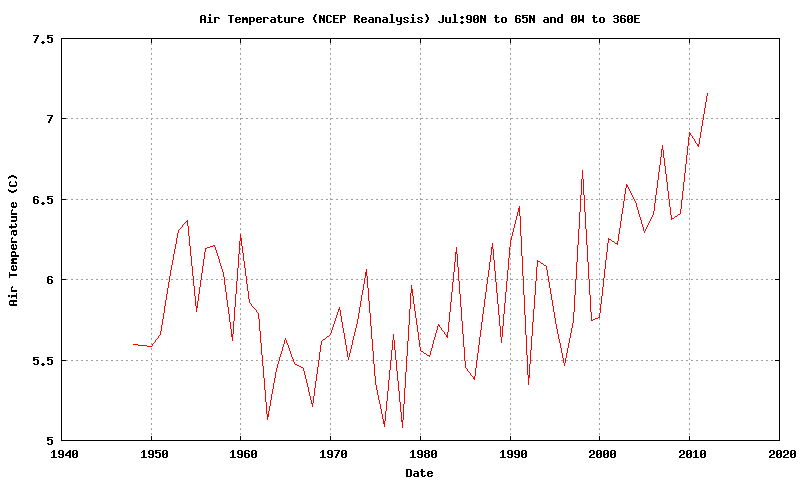 GISS has a longer timeseries, is from instrumental data, not reanalysis, and covers the 1930s and 40s. Fig 4. An old plot of Arctic temperature from GISS banded data. But in terms of Melles et al, where are we? In their paper they state that the warmest month is assumed to be July. So what do Arctic temperatures look like over July? Fig 5. NCEP/NCAR July Average Surface temperature for north of 65 degN. Melles et al finds a 1 to 2 degC warming during the HTM, it looks like we're at least at the lower end of that. However they may be referencing to pre-industrial, and NCEP/NCAR doesn't go that far back, while GISS doesn't have the data needed publicly available (in an interface an idiot like me can handle without a lot of hassle). Melles et al also find super-interglacials with a warming of about 4 to 5 degC, based on July Temperatures, so we're still some way off that, for now. But we have two substantially different base processes driving now and the changes in the ice ages. During the HTM the driver was increased insolation, as far as I'm aware this was mainly due to the precessional cycle (tilt of the Earth). So while this delivered 40W/m^2 in July at 65degN, it would also have implied substantially reduced insolation in winter, whereas now the forcing from CO2, its resultant global warming and the warming of extra-Arctic atmospheric heat flux, operates year round. This is especially important in winter, when the Arctic is in darkness and infrared emission is the key player in heat loss, especially in view of the importance of infra-red emission for sea ice thickening. These considerations may explain why a 40W/m^2 forcing produced similar effects that a forcing of under 2W/m^2 is producing now, e.g here. However crucially, the temperatures and sea ice conditions I have referred to in this article were applied to a greater or lesser degree for millennia. It's hard to see how out of all the past warmings there were not conditions similar to now with regards the inundation of the East Siberian Shelf. And yet we did not see a catastrophic methane blow out. Frankly I'm getting bored of Arctic methane. I think it's time to leave this matter until someone comes up with a viable mechanism to get heat down into the sediments, together with an explanation of why it wasn't active in the past interglacials and super-interglacials. What's bothering me right now is not the prospect of a massive rapid and catastrophic blow out, but the possibility that the PETM may have been curtailed due to geographical accident, raising the possibility that we may face something approaching the End Permian. In comments on my previous post Remig made a point that's troubled me greatly, if she/he's correct then the PETM may have been curtailed before serious ocean warming took hold and more methane hydrates were able to destabilise. Jakobsson et al, 2010, "New insights on Arctic Quaternary climate variability from palaeo-records and numerical modelling." PDF. Kaufman et al, 2004, "Holocene thermal maximum in the western Arctic (0-180 W)" PDF. Melles et al, 2012, "2.8 Million Years of Arctic Climate Change from Lake El’gygytgyn, NE Russia." Does it make a difference for us whether another Azolla event is or is not possible? I mean, I imagine that there's an upper limit to how rapidly such an event can sequester CO2, and considering the insanely rapid pace of our own emissions, I'd be very surprised if an Arctic "lake" were able to do much to draw down CO2 on our timescales. It might make a difference over tens or hundreds of thousands of years, and from the perspective of life on Earth Azolla vs. No Azolla might well mean the difference between catastrophe and unpleasantness, but on the timescales of human civilization...I can't see how it makes any difference one way or another. The point with regards Azolla is not that it could help us now. It is that if the PETM wasn't another End Permian only because of the accident of Azolla and the geography that facilitated it, then what we are doing could be far more dangerous than I had thought. It seems possible that during the PETM the oceans were kept from reaching equilibrium warming by Azolla drawing down CO2. If that is the case then the PETM analogue for the present day is incomplete - precisely because there will be no Azolla CO2 draw down this time. There's a lot of concentration on Arctic methane, but if we face a more persistent warming than the PETM then lower latitude hydrates may come into play. As I've said many times, I think this will be a slow process over thousands of years. The fact that I will be long dead, is comfort only from a purely selfish standpoint. Ah, okay. Fair enough; I'm likewise certainly not keen on Earth going through something like the End Permian again (not keen on it going through something PETM-ish either, of course, but that'd be preferable to Great Dying Part II). Dangerous Things Done in Desperation.